I didn't want to post this in the all-purpose religion thread/trainwreck because it's actually broader than just religion. Psychologists have known for a while now that it's harder for our brain to overwrite existing beliefs than to reject any new information that contradicts those beliefs. So ideology often trumps facts, which I think accounts for half of the arguments we have here (and political arguments, in general). There are both polling and experimental data that demonstrate that people will often double down on beliefs that are shown to be false. I'm sure we can all think of examples (and maybe if we're honest with ourselves admit to being guilty of it, as well). Short answer, yes. Long answer, yes, and I can shamefacedly recall several instances in the past when I insisted in the face of overwhelming evidence that something I believed in was true. Even with that awareness it's incredibly hard to recognize in the moment that that is what you're doing. Perhaps a mod should change the name from the Religion/Politics/World Events Forum to the Motivated Reasoning Forum. It's hard to accept evidence contrary to your point of view because if you do that all the time you'll be changing your opinion all the time and then you get labeled as a flip-flopper. I refuse to believe that article. All that article did was make me realize that none of these political labels apply to me. I'm smarter than psychology! I don't believe it! But are you smarter than reverse psychology? I think that article conflates two very separate things. It's one thing to point out that the specific facts that someone builds their ideology around are wrong---but ideologies and political positions involve much more than a summation of facts. I'm sure if the United States had not entered WWII, there would have probably been much less loss of life and much less physical destruction. Do those facts prove that we should have not entered the war? Ideologies and political positions certainly involve facts, but they also involve values, cultural mores, philosophical positions, knowledge of historical precedents and human nature, the weighing of inevitable positive AND negative repercussions---and, unless you're omniscient, a good deal of haphazard guessing and hypotheses about how the future may play out given various scenarios. For instance, that author seems to be saying there's a "correct" position on gun control (one which, conveniently, he now subscribes to) that is virtually scientifically verifiable by hard facts and data. To quote one of our esteemed forum members: "Hogwash!" I think that article conflates two very separate things. He's not conflating anything. He's saying that you are welcome to your ideology but that it needs to be open to adaptation as new information becomes available. And that's fine, but I'm just pointing out that two people can agree completely on the hard facts, numbers and data of an issue, and still hold vastly different positions on that issue. Tha's not an arguement, it's just contradiction. I know Shermer's writings very well, he ran Skeptic (a magazine dedicated to debunking erroneous beliefs) for years. This article has less to do with motivated reasoning and more to do with Shermer's changing political orientation as he gets older. It's fairly clear from his writings that he's moving farther and farther away from his libertarian roots on multiple issues. He's an extremely rational person trying to cope with his changing beliefs. It's not that uncommon for people to change political orientations as they age. Most people grow more conservative as they age, tied to major life events such as marriage and children. Shermer seems to be moving in the opposite direction. I came into this thread with a fervent belief that I did indeed suffer from motivated reasoning. This thread confirmed that belief. Everybody knows that our political views can sometimes get in the way of thinking clearly. But perhaps we don't realize how bad the problem actually is. According to a new psychology paper, our political passions can even undermine our very basic reasoning skills. More specifically, the study finds that people who are otherwise very good at math may totally flunk a problem that they would otherwise probably be able to solve, simply because giving the right answer goes against their political beliefs. The study, by Yale law professor Dan Kahan and his colleagues, has an ingenious design. At the outset, 1,111 study participants were asked about their political views and also asked a series of questions designed to gauge their "numeracy," that is, their mathematical reasoning ability. Participants were then asked to solve a fairly difficult problem that involved interpreting the results of a (fake) scientific study. But here was the trick: While the fake study data that they were supposed to assess remained the same, sometimes the study was described as measuring the effectiveness of a "new cream for treating skin rashes." But in other cases, the study was described as involving the effectiveness of "a law banning private citizens from carrying concealed handguns in public." The result? Survey respondents performed wildly differently on what was in essence the same basic problem, simply depending upon whether they had been told that it involved guns or whether they had been told that it involved a new skin cream. What's more, it turns out that highly numerate liberals and conservatives were even more—not less—susceptible to letting politics skew their reasoning than were those with less mathematical ability. But we're getting a little ahead of ourselves—to fully grasp the Enlightenment-destroying nature of these results, we first need to explore the tricky problem that the study presented in a little bit more detail. 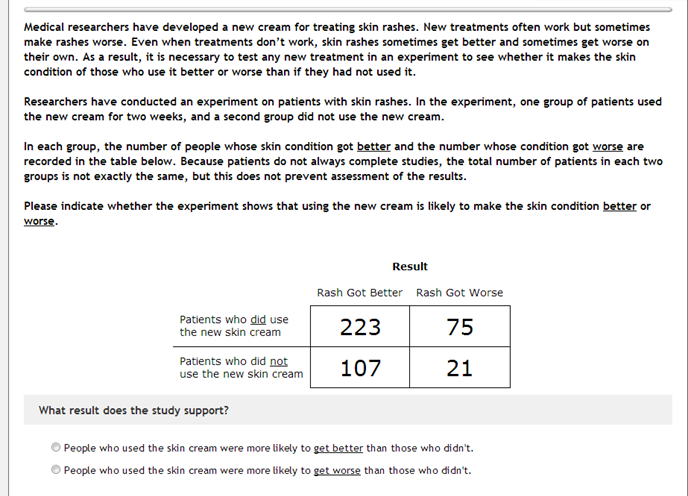 As you can see above, the survey respondents were presented with a fictional study purporting to assess the effectiveness of a new skin cream, and informed at the outset that "new treatments often work but sometimes make rashes worse" and that "even when treatments don't work, skin rashes sometimes get better and sometimes get worse on their own." They were then presented with a table of experimental results, and asked whether the data showed that the new skin cream "is likely to make the skin condition better or worse." Not surprisingly, Kahan's study found that the more numerate you are, the more likely you are to get the answer to this "skin cream" problem right. Moreover, it found no substantial difference between highly numerate Democrats and highly numerate Republicans in this regard. The better members of both political groups were at math, the better they were at solving the skin cream problem. But now take the same basic study design and data, and simply label it differently. Rather than reading about a skin cream study, half of Kahan's research subjects were asked to determine the effectiveness of laws "banning private citizens from carrying concealed handguns in public." Accordingly, these respondents were presented not with data about rashes and whether they got better or worse, but rather with data about cities that had or hadn't passed concealed carry bans, and whether crime in these cities had or had not decreased. So how did people fare on the handgun version of the problem? They performed quite differently than on the skin cream version, and strong political patterns emerged in the results—especially among people who are good at mathematical reasoning. Most strikingly, highly numerate liberal Democrats did almost perfectly when the right answer was that the concealed weapons ban does indeed work to decrease crime (version C of the experiment)—an outcome that favors their pro-gun-control predilections. But they did much worse when the correct answer was that crime increases in cities that enact the ban (version D of the experiment). The opposite was true for highly numerate conservative Republicans: They did just great when the right answer was that the ban didn't work (version D), but poorly when the right answer was that it did (version C). For study author Kahan, these results are a fairly strong refutation of what is called the "deficit model" in the field of science and technology studies—the idea that if people just had more knowledge, or more reasoning ability, then they would be better able to come to consensus with scientists and experts on issues like climate change, evolution, the safety of vaccines, and pretty much anything else involving science or data (for instance, whether concealed weapons bans work). Kahan's data suggest the opposite—that political biases skew our reasoning abilities, and this problem seems to be worse for people with advanced capacities like scientific literacy and numeracy. "If the people who have the greatest capacities are the ones most prone to this, that's reason to believe that the problem isn't some kind of deficit in comprehension," Kahan explained in an interview. So what are smart, numerate liberals and conservatives actually doing in the gun control version of the study, leading them to give such disparate answers? It's kind of tricky, but here's what Kahan thinks is happening. Our first instinct, in all versions of the study, is to leap instinctively to the wrong conclusion. If you just compare which number is bigger in the first column, for instance, you'll be quickly led astray. But more numerate people, when they sense an apparently wrong answer that offends their political sensibilities, are both motivated and equipped to dig deeper, think harder, and even start performing some calculations—which in this case would have led to a more accurate response. "If the wrong answer is contrary to their ideological positions, we hypothesize that that is going to create the incentive to scrutinize that information and figure out another way to understand it," says Kahan. In other words, more numerate people perform better when identifying study results that support their views—but may have a big blind spot when it comes to identifying results that undermine those views. The Scottish Enlightenment philosopher David Hume famously described reason as a "slave of the passions." Today's political scientists and political psychologists, like Kahan, are now affirming Hume's statement with reams of new data. This new study is just one out of many in this respect, but it provides perhaps the most striking demonstration yet of just how motivated, just how biased, reasoning can be—especially about politics. Interesting article. Thanks for posting, Navinabob. It'd be really interesting if such studies had been conducted historically to have some basis of comparison. I'd think the news media would have to bear at least some responsibility for people's current tendency to become more obstinate in the face of contradictory facts. Often it takes all of two seconds to find a 'reputable' online outlet that will twist facts to prove whatever you want proven. Even in instances where the truth should be clear cut, it's typically not hard to find what appears to be an intelligent, fact-based and well-written argument to the contrary. A lot of people, rather than taking this as motivation to always dig deeper, instead just gravitate to the outlets that give at least a superficial appearance of proving out the legitimacy of their already held views. I also agree with Ky-Fi's point. Say X action decreases undesirable Y but increases desirable Z. Two people can be in complete agreement about the effects of X, but if one's values prioritize Y and the other's prioritize Z, they can be in complete disagreement over whether to undertake X. The author of the original article does seem to overlook, or perhaps intentionally ignore, that fact. I'm a couple months behind on them (I shifted to Teller's podcast for a bit and will catch up later). I'll look forward to it. Sounds like John Zaller's RAS model (ie, political scientists indentified the process 20 years ago). I don't have the full quote with me, but his point was that once you adopted a firm belief in something, it closed off all other avenues of inquiry and prompted you to block out new information that might cause you to question that belief. Often it takes all of two seconds to find a 'reputable' online outlet that will twist facts to prove whatever you want proven. I think this is the main culprit. We see so often that something comes out with fanfare and is almost immediately debunked. Many a dino dig in China has been that way, NASA announcing life on Mars, and the like. Get beyond that and you have studies that seem very contradictory all the time. It isn't that people won't believe facts, but that facts are often not truly "facts" by their definition. As a result, people come to be wary of anything given forth as a "fact" in the true meaning. Do I believe all the studies that say that second hand smoke is bad for me, or do I believe the huge EU study that can't find anything bad (health wise) about it? Do I believe this one group of scientists, or do I believe this other group? Do I believe the headline on CNN, or do I take a cautious approach and see if it stands the test of time (usually less than a month) to see if it was actually true? In the late 90s, I had a summer job as Dan Kahan's research assistant. Make of that what you will. Dr. Dunning, a professor of psychology at Cornell, worries about this because, according to his research, most incompetent people do not know that they are incompetent. One reason that the ignorant also tend to be the blissfully self-assured, the researchers believe, is that the skills required for competence often are the same skills necessary to recognize competence. The incompetent, therefore, suffer doubly, they suggested in a paper appearing in the December issue of the Journal of Personality and Social Psychology. ''Not only do they reach erroneous conclusions and make unfortunate choices, but their incompetence robs them of the ability to realize it,'' wrote Dr. Kruger, now an assistant professor at the University of Illinois, and Dr. Dunning.